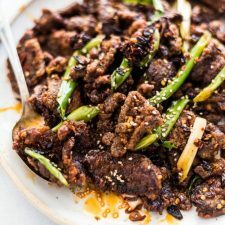 Crunchy, crispy beef tossed in a super umami hot chili oil that is packed with fried shallot, chili flakes, and Sichuan peppercorns. Scroll down to learn how to make this addictive dish with only four ingredients. 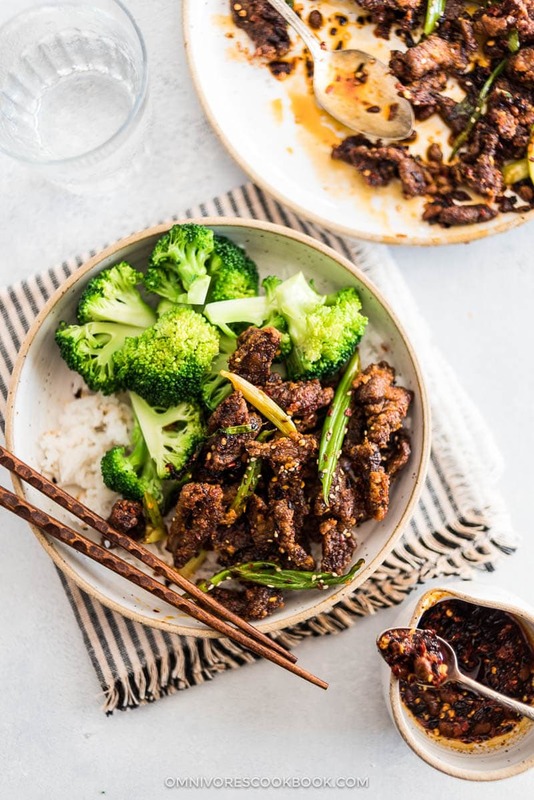 Unlike most of the saucy stir fry dishes you see outside of China, which is Cantonese style Chinese food, stir fries from Sichuan cuisine use more aromatics and chili peppers to create the flavor base. In other words, they are “dry” stir fry. 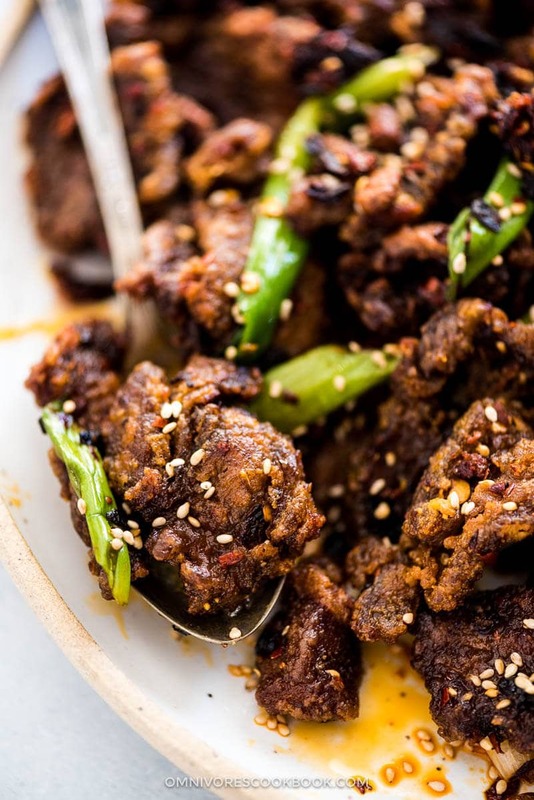 This Sichuan crispy beef belongs to this category. In China we call it dried fried steak, or 干煸牛肉 (Gan Bian Niu Rou) in Chinese. The words “Gan Bian” refer to a Chinese cooking technique of pre-cooking the ingredients in hot oil to let them dehydrate slightly, creating a crispy crust and tender interior. This technique applies to vegetable dishes as well: for example, the famous Sichuan Dry-Fried Green Beans (干煸豆角) belongs to this category. Once the meat or vegetable has been pre-cooked, it forms a surface that is full of nooks and crannies that hold spices very well. 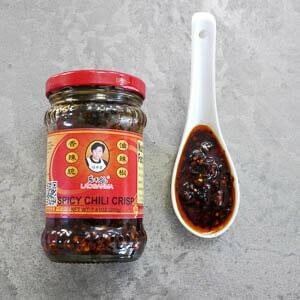 No matter if you’re using a splash of soy sauce, a pinch of salt, or in this case, the hot chili oil, the main ingredient will be perfectly seasoned without using a sauce. You might not be familiar with this type of stir fry. But if you love spicy food, I highly recommend you be adventurous and give it a shot. You’ll be hooked in a matter of seconds! What is Lao Gan Ma hot sauce? If you asked me what the most famous hot sauce brand in China is, I would say Lao Gan Ma (老干妈), or The Godmother. This brand has numerous types of flavors, often loaded with fried soy beans, fried peanuts, crispy shallot, garlic, chili flakes, and fermented black beans. Although the “hot sauce” is closer to a flavored chili oil, we just call it hot sauce, or 辣酱, in China. The sauce doesn’t taste as spicy as it looks — it has more of an intense, aromatic umami sensation. 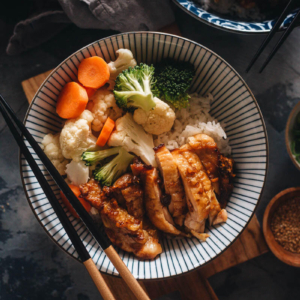 It might not be the most healthy sauce, but it is the best shortcut if you want to recreate authentic Sichuanese flavors. When you open the jar, you’ll immediately notice a heavenly, nutty-spicy fragrance leaping out. I wouldn’t be surprised if you start snacking on the sauce with a spoon. 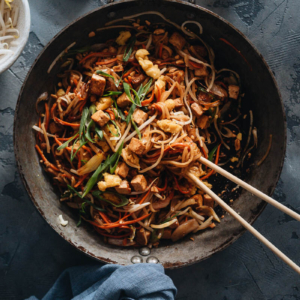 When you make a stir fry, simply scoop out a few spoonful of the hot sauce to add into the pan, with a pinch of salt or a few drops of soy sauce. It instantly makes everything taste 10 times better. In fact, not just for stir fry — I heard some people use it on everything. For example, add it in salad dressing, mix it with pasta sauce, spread it on bread, or… drizzle it on cupcakes (!!??). 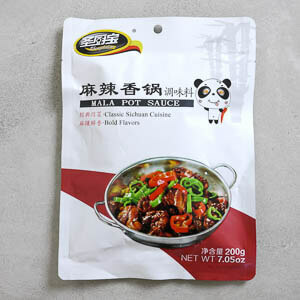 You can find the Lao Gan Ma sauce in most large Asian markets, although the flavor types vary. If you do not live near an Asian market, you can get the Lao Gan Ma Chili Crisp at The Mala Market. The Mala Market is my partner’s online store that carries premium Chinese ingredients and Sichuan specialties delivered to your door. 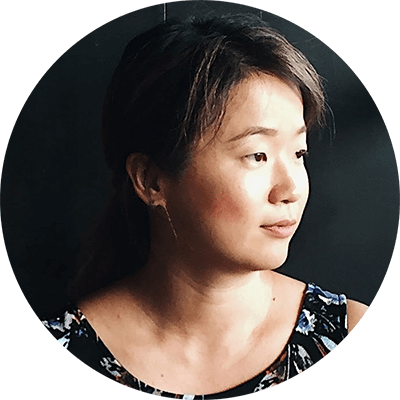 The owner Taylor is the blogger behind The Mala Project, an award-winning food blog sharing authentic Sichuan recipes. 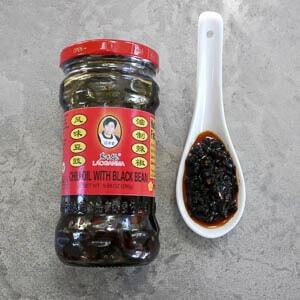 If you shop at The Mala Market, definitely grab a bottle of Lao Gan Ma Black Bean Chili Oil as well. The Chili Crisp flavor is the most popular one, but some of my friends love the Black Bean flavor even better. (1) Slice the beef against the grain, so it yields a tender texture once cooked. One of my favorite cuts for stir fry is the flank steak. In the picture below I show you how to cut half of a flank steak. 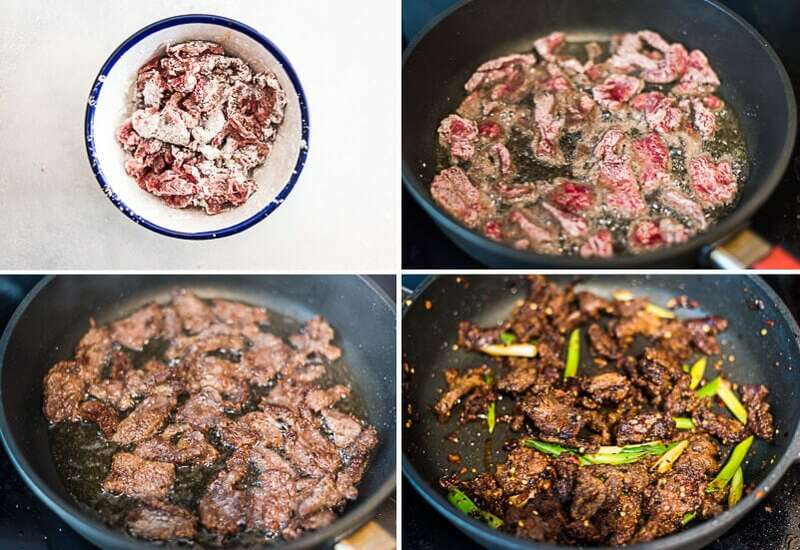 (2) To create ultra-crispy beef with a melt-in-the-mouth center, use enough oil to cover 1/4-inch (5-mm) of your pan so the beef will be deep fried properly. (3) To create a healthy dish with less oil, use just enough oil to cover the pan. It can be anywhere from 1/4 cup to 1/3 cup if you use a large frying pan. In this case, the beef will still have a crispy crust, but it does not stay crispy as long as the deep fried beef. (4) To add vegetables into the dish, you can use chopped onion and celery (about 2 cups chopped veggies) before adding back the beef (step 5 in the recipe). (5) You can also add the steamed broccoli during the stir fry (in step 5), and use a bit more chili sauce. (6) The beef remains crispy and delicious after it cools down as well, but it tastes best when it’s right off the stove. Combine beef, salt and oil in a large bowl. Gently mix by hand until all the beef slices are coated with oil. Marinate for 5 to 10 minutes. Add cornstarch one tablespoon at a time. Mix to coat the beef. It’s OK if the beef is not evenly coated. Heat oil in a large nonstick pan over medium-high heat until hot. Carefully spread the beef slices with minimum overlapping. 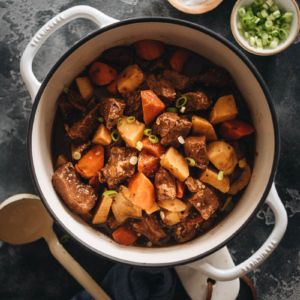 You might need to cook the beef in two batches depending on the size of your pan. Cook until the bottom turns golden and crispy. Flip the slices to fry the other side, until golden brown and crispy. Transfer beef to a large plate. Remove the pan from the stove. Use a few layers of paper towels attached to the front of a pair of tongs to remove the oil. Alternatively, you can carefully pour the oil into a ceramic bowl. Return the pan back to the stove. 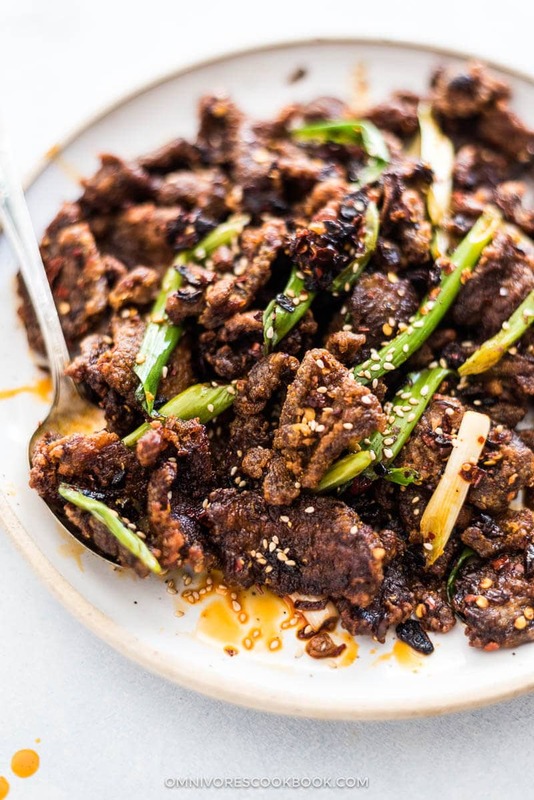 Return the beef, pour in the spicy chili crisp, and add the green onion. Stir and cook until the beef is evenly coated with the chili oil. Transfer to large plate. Garnish with sesame seeds, if using. Serve hot over steamed rice and vegetables. This makes me drool! Lao Gan Ma, one of my favourite spicy sauce. Pinning! I’m amazed you can make this with just these few ingredients, Maggie – just wonderful! 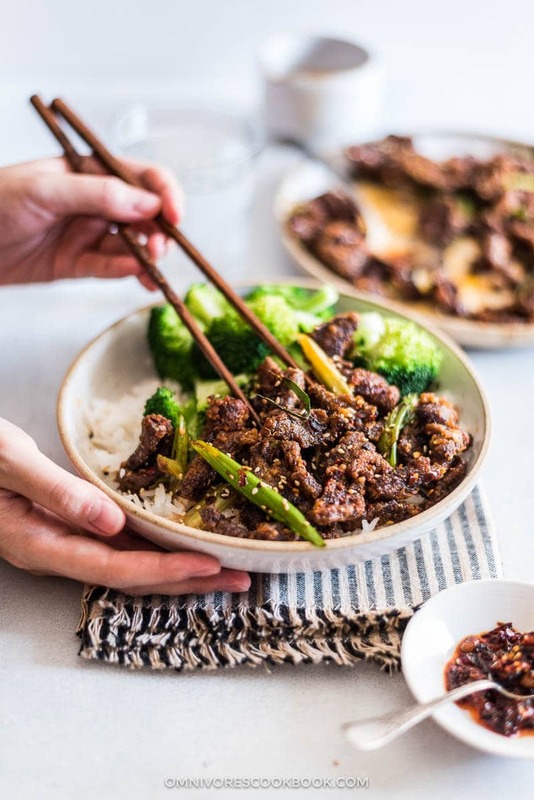 Crispy beef is always one of my favourite things to order from a takeaway – thank you for making it so easy to recreate at home! I agree with you, crispy beef is a classic and I always crave more! I had a go at this tonight. I could only get Lao Gan Ma Crispy Chilli Oil so I used that. Is there a way to stop the fat from spattering every pot on the stove? I cooked the beef in a 11″ dia frying pan. It was very tasty and enjoyed by everyone here. I will cook it again. Hi Erica, what you can do is to pat dry the beef thoroughly before cutting, so make sure there is no liquid on the surface. The beef will release some juice during cooking, so it’s very common to have some splatter. You can solve the problem by either using a slightly deeper pan (some of my readers use dutch oven for stir fry and reported back very positive result), or use a oil splatter screen. Yum yum! Thank you, Maggie! Hi Maggie, everything I have made from your website has all been just fantastic and this is no exception. 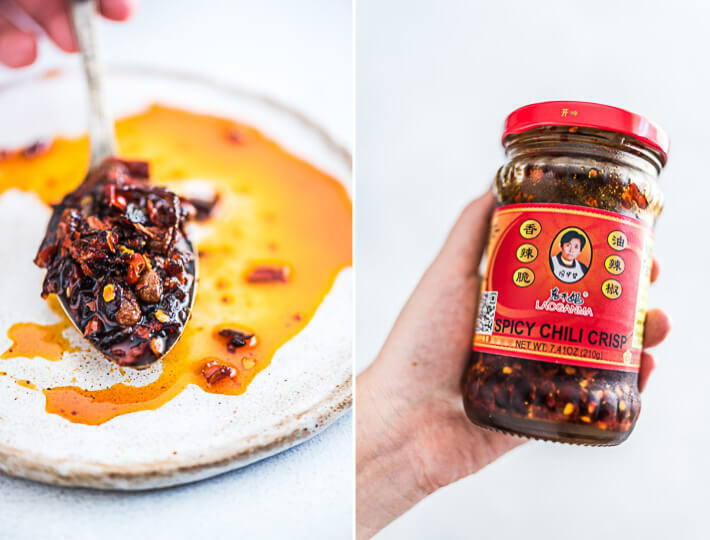 I really enjoy working with the spicy chili crisp sauce and was wondering if you think you will be doing more recipes with this ingredient! It seems like too much of a gem to not use with more variety. =D I have actually stopped ordering so much Chinese food because the stuff I make at home is better now because of all the stuff I learn here.